I’m freaking out a little because this is one of the busiest times of year at work, but I know this will make a huge difference in my life and hopefully in the lives of those we come in contact with while we are there. Please pray for us. We need lots of prayer (our whole mission team does). There are 12 of us going. My hardest day will be the day we minister to the children at the orphanage. We will be taking them to a pool/park for the day. I will want to bring them all home with me. I know I will wish that Mexico had an agreement for adoption with the US by the time I leave. 😦 Pray that God speaks to Kevan and I about what he would have us do regarding children. Adopt, continue to wait or give up on children all together. We just don’t know. 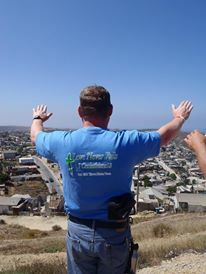 Here is a picture, from last year, of Kevan praying over one of the towns near Tijuana. Sorry the pics are so small. I saved them from Facebook so I’m not sure if that is why they are so little. 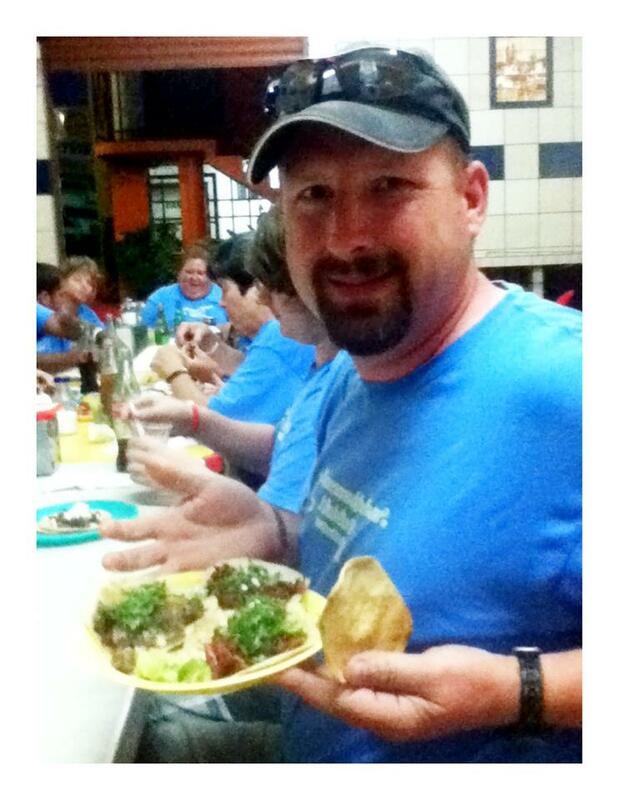 And here is a picture of Kevan loving some of the Mexican food (his favorite) while there. 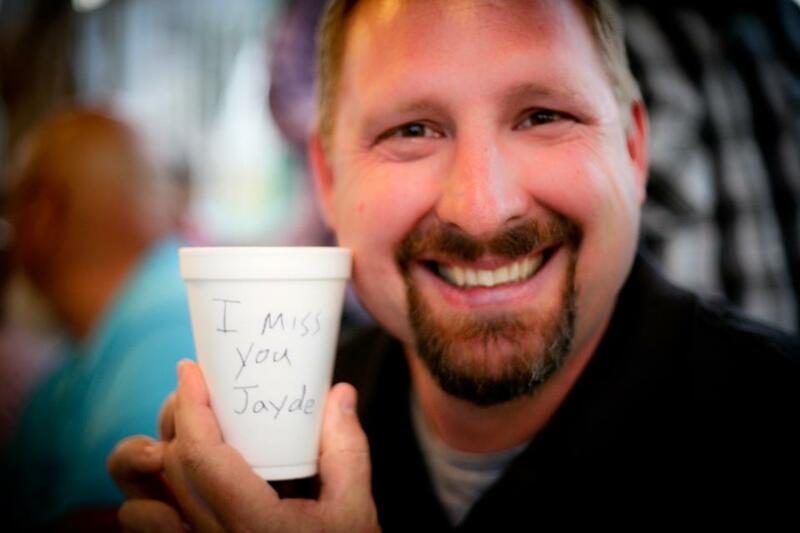 Here is a sweet message to me while I was home recovering and he was there. I missed him so much! This is one of my favorite pictures of him. He doesn’t like to smile in pictures normally so this is such a sweet picture of who he really is. I love this man. He is my best friend. Thank you Lord for him. 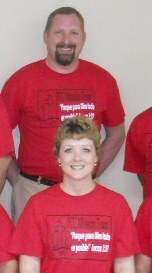 Lastly, here is a picture of Kevan and I that I cut out of our whole mission team photo. 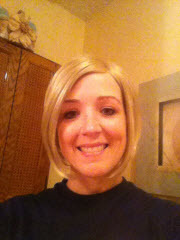 I didn’t get permission from everyone else so I didn’t feel comfortable posting their picture on the World Wide Web. These are the shirts that our team will be wearing this year. Thank you to all of you that will be praying for us this year. Please pray for our safety, our strength, health and that we will stay united as a team to accomplish what God has planned for us. Also, please pray for those that we will come in contact with and that we will show the love of Jesus to all.